That's a lot of green. It is a chartreuse-y green color, a bit darker than how it looks in the photo. Pam's dining room table was commandeered for this. I could do it at home but it's way more fun to be laughing and giggling together over pattern pieces. The dress can be ankle-length but that's not what I wanted. This will be just a bit below the knee. 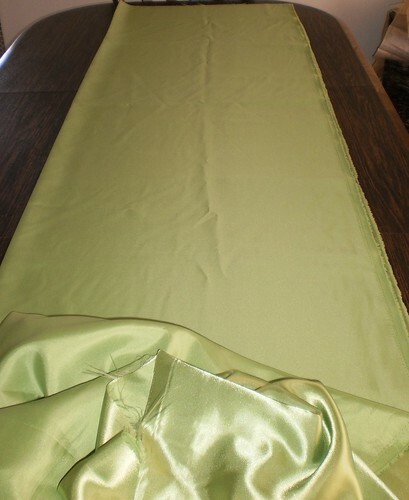 We added an inch to the hem to make sure, once I hem it, there's enough to be at the length I want. 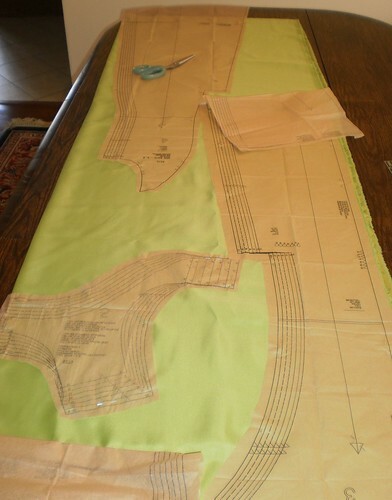 In pinning the pieces to the fabric, we noticed there's a front pleat, that left turn you see on the right piece. We hadn't noticed that on the drawing or the photo of the finished piece on the pattern bag. It doesn't change whether I will or won't make this, it was just something interesting to find. After work today, I will go to the fabric store. I don't have thread this color nor do I have a 20 inch zipper. Once I get those, I am in business. This should be done by week's end. Then Pam and I can hem it. The wedding is less than a month away. Things are falling into place.